We were a packed crowd seated on child-sized fold-up chairs. Whoever had set them out clearly had forgotten that people have legs, the rows too smushed together. Salvatore Scibona was trying out his small repertoire of French – nearly nonexistent, but endearing. I hoped the French audience members weren’t cringing. He had never been to France before, he said, quickly switching to English. No one in his family had, either. He couldn’t believe he was here. The French translation of his debut novel had come out. The End. That’s the name of the book, but there seems to be no end to the accolades heaped upon it. The book has won numerous awards – The Young Lions Fiction Award, The Whiting Writer’s Award, finalist for the National Book Award. His hometown of Cleveland (the “flyover part of the country” he claimed New Yorkers call it – I have never heard that, but it’s pretty good), used to be a series of ethnic enclaves. Italian here, Polish there. Slovakian and all slices of Eastern European. After the second world war a lot of blacks from down south moved up to Cleveland and other industrial areas. Just like that, people “stopped being Italian [or insert ethnicity] and started being white,” he said. And all of the privileges that came with that. With a name like Salvatore, there’s no hiding his origins. But he’s never thought of himself as anything other than white. (A year spent in Italy probably confirmed he wasn’t Italian – he spent the entire year there crying, he said). His book explores 1950s Cleveland, using a town carnival as the conceit. From the way he talked about it and the excerpts he read, it sounds as if he takes on tense racial dynamics all while grounding them in believable story. His characters are racist, he said, but they are real people. His primary role as the writer was to let his characters express who they were, not try to create a book to serve a political message. Though, of course, it does. I haven’t read the book so I can only conjecture how he pulls it off. But it’s refreshing, an author diving into such meaty territory, not shying away from what others might be too scared to touch. It made me think, the US has a mighty messed up record on race, but at least we talk about it. Not always well, not always as much as we should, but we do discuss it. The French lag behind in this regard. You can’t even use the word “race” in a conversation. (I’ve tried it. It is obviously an offensive word.) No statistics are kept on ethnic background because everyone is “French.” Nice sentiment, sure, but not a reflection of reality. I haven’t been following the debate on French “national identity” too closely, but there seem to be some pretty strong opinions about what French does and does not look like. Remember the youths burning cars in the “suburbs” a few years back? They were disenfranchised youth, and yes, mostly of a certain color. But were the French able to say that? Not really. Frustrations build ever further when you’re not even allowed to name who you are, what seems abundantly apparent. There are a lot of French citizens who feel they are not French. Every society has its own demons to contend with; there is no end in sight. More frank discussion might help, though. Liberté, egalité, fraternité, looks good as a motto, but would be even better as the truth. There’s no point trying to be a morning person if bleary-eyed, grumpy, and alarmingly catatonic is the best you can manage. As I found out today, there’s also no point strolling down Rue Faubourg Sainte-Antoine on a Monday – most everything is closed. Monday? Don’t people work on Mondays? Still, it brings me to a point: It’s supposedly charming that most things in Paris are closed on Sundays: a true day of rest, time for family and friends. The crude call of capitalism not trumping cultural tradition, and all that. It’s also nice for workers that they receive two days off in a row. Thus, shops open Saturday were not open today. The Sunday/Monday weekend. In my more generous moments, I can get behind these ideas. But in practice, I’m not a big fan. After living in New York, Paris can strike me as provincial – as strange (or snooty?) as that sounds. 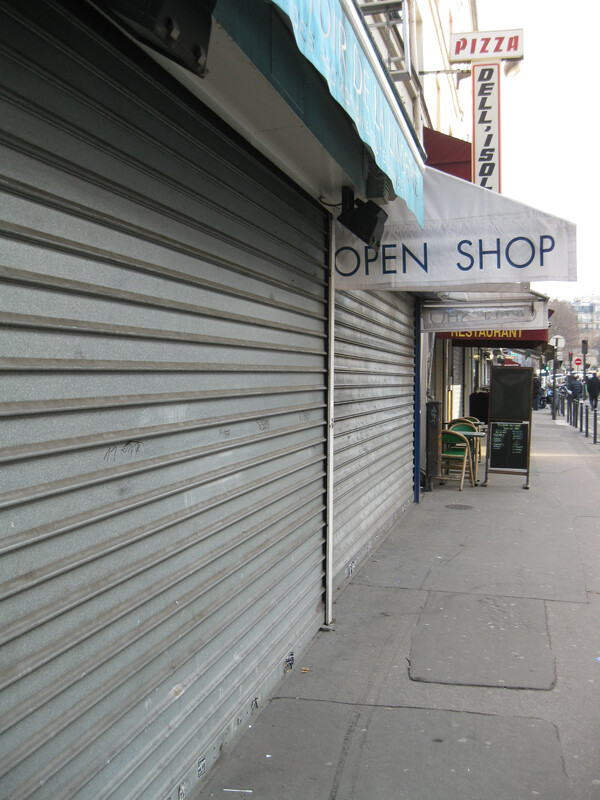 I have enough trouble with the ‘Sunday blues’ (surprisingly less virulent now that I don’t have a job), that shuttered storefronts lead only to further depression. The cold metal door on a Monday? Just silly, really. So should everything everywhere be available at all times? Well, now that you ask….um, yes? Inconvenience as elegance. Paris has duped me again. 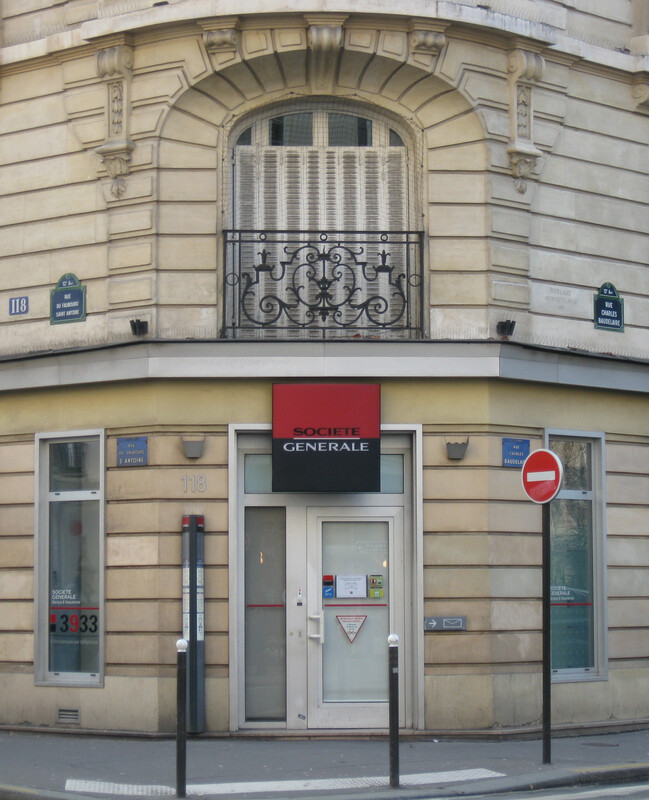 Societe Generale, shut to the world. What do you think? Stores closed Sundays and Mondays – charming or inconvenient? Comment below! Do you see a mouse in this picture? Behind the Scooby Doo? (Ok, what am I doing in a café with a large Scooby Doo figurine? Never mind that). Having overpriced hot chocolate (5 euros!) in the Latin Quarter and my friend Danielle’s eyes suddenly grow huge. “Oh my god,” she says. “What?” I ask, knowing full well I probably don’t want to know what, judging from the look on her face. I slowly turn around to look, then think better of it. In other words, if I don’t see it, I will not start screaming and knocking tables and chairs over. (Though passing as a strong and capable woman most of the time, I am one of those throw your hands in the air, jump on the table, and scream for her life girly-girls when it comes to episodes like these). I get up as quickly as I can, grabbing my coat and backpack, and run to the other side of the room (which is not very far, incidentally, but far enough). Danielle rescues our two hot chocolates and places them on the table. I inspect our new seating arrangement – just a simple wall behind me, everything plainly in sight. No random cartoon character sculptures where rascally rodents might hide. Danielle spies a small hole in the ground, but I reason that ground level is more acceptable than head-level should something else come popping out. “We can pretend we’re having a Ratatouille moment,” Danielle says, trying to make the best of it. Yes, Ratatouille, I loved that movie, with the cooking cartoon rat. But then I start thinking of a real rat and gross myself out. “Thank god it wasn’t a rat,” I say, leaving it at that. You would think by trying to tactfully ignore the establishment’s mouse-incubating interior, the servers could give us a break. But no, what do I hear a few minutes later? “Quel bordel!” What a mess! The waiter is complaining about the disarray of tables and chairs we’ve left behind in escaping the offending area. “There was a mouse,” Danielle says. Should be explanation enough. It doesn’t seem to be, though. He continues saying something – I’m no longer listening. I’ve had bad service in Paris, but being made to feel as if I’ve done something wrong by moving away from a mouse – well, it’s pretty up there. Just another night out in charming gay Paree! Day Two of what was to be a literary lovefest (a reading almost every night) and already I am rethinking. After last week’s amazing encounter with Nam Le – a writer brilliant, funny, and shockingly down to earth – this week’s offers have rubbed me slightly the wrong way. The fault doesn’t lie entirely with the authors, though they haven’t been my favorites. The audience itself has also induced some dismay. 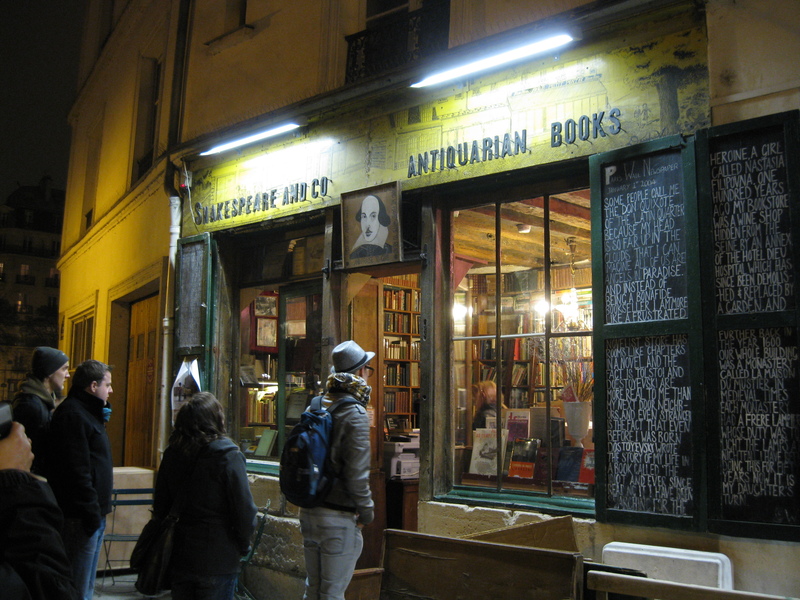 Front row of Shakespeare and Co. and there’s a beautiful young woman sketching in red pencil. She glances up-down, up-down as she transfers the writer’s likeness to her drawing pad. I assume she’s quite earnest, but she seems to know she’s on display. Right next to her is the real article, however, who won’t reveal himself until the final round. My eye already on him (his profuse profound nodding a clue), it wasn’t until he asked the last question that I truly knew. In a meandering philosophical ramble, invoking too many ideas and names, he did (finally) ask a good question, but his way of doing it – totally lame. 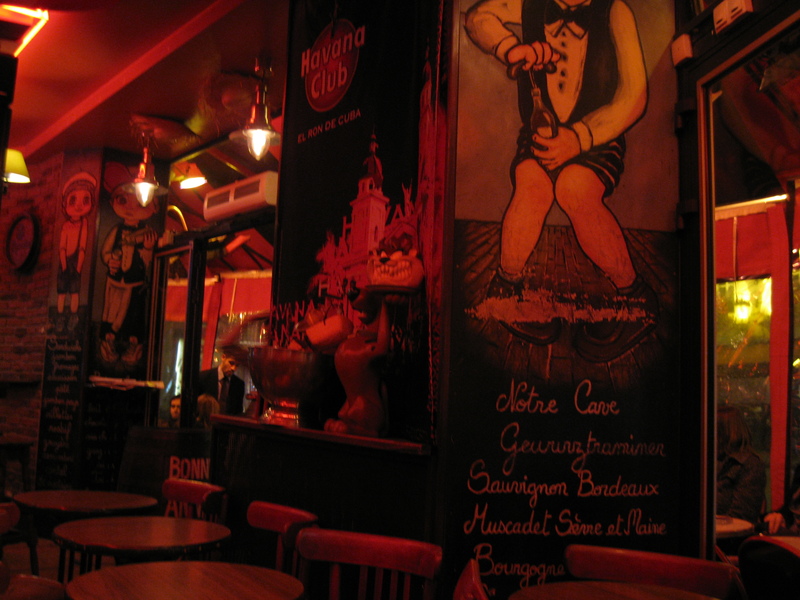 Nevermind, it’s a new night, this time in the 7eme. Only, there he is again! And saving his worst for last! A digression from Fitzgerald to Byron, he recites whole passages of poetry, then challenges the author to do the same. Looks like now I am forced to. Let the real games begin! Banal as it may sound, bureaucracy is truly one of the worst parts of living in France. I won’t bore you with my particular travails (plural), but suffice to say that the stereotype of a labyrinthine (and laborious) system is true. So I couldn’t help but be tickled today when Yahoo France’s main story was titled, “Sarkozy, Still French?” Seems it gets dicey for even the president of the republic to swim in these administrative waters. The French are all for their polemics (there’s a big one on right now about “national identity”), so part of this is simply political showmanship. Jean-Luc Melanchon, head of the ‘Left Party’, (and formerly with the Socialists – yes, many more than two parties here! ), went to renew his French ID card. Should be easy, right? He already has one. And he’s French. And he’s a freaking government minister. No, naïve ones. Of course it’s not that easy. I like Jean-Luc, because he’s in a position of power – someone for whom it’s normally easy – and decided to go public and say, you know, this system is kind of loony. He was asked to “prove things that one cannot prove” he recounts of his ordeal. (One of my stories of proving things you cannot prove was providing a “certificate of celibacy” before my wedding. For real. Promise I’ll tell you about that later). It got him to wondering, how does Nicolas Sarkozy, born to Hungarian immigrant parents prove this stuff? Sarkozy, with all the anti-immigrant legislation he’d like on the books, Jean-Luc contends, just might not make the cut as French himself. So still French? Well, we’ve already established that I’m an etrangere, a foreigner, a stranger. So I can never be French (French in the way the French mean it, I guess). Ah yes, the vagaries. As good and loyal as I’d like to think of myself, I’d agree with Jean-Luc – sounds like a darn hard thing to prove. Well, I have a few years to work on that. And I’m getting some pretty good practice in the meantime. I cannot say whether the gut-wrenching catastrophe in Haiti this week has touched more deeply in France because of the two countries’ history. All eyes – from all over the globe – are on Haiti. Our hearts there, too. We are all moved, all in mourning. I scroll through images of the injured, the dead, the trembling, the terrified, watch reporting from an entire city now in complete ruin and I can’t stop from crying. Anyone would weep, no matter where they are from. France does have a unique link to Haiti, however, and it seems has a special responsibility due to its past. Its former colonial rule – brutal and unforgiving – should not be forgotten. I don’t know enough about these things, certainly not as much as I should. I am experiencing this tragedy as a human being above all – not as an American or a resident in France. There are interesting things to consider there, though. The French government must understand that, too, as they have already called to cancel all of Haiti’s debt and for an international donor’s conference to discuss rebuilding. I donated to Partners in Health (PIH) today, and found some measure of inspiration as I learned of the organization’s history. Founded 25 years ago with a mission they call both medical and moral, they have been providing health care to the poor on a consistent basis, not only when natural disasters strike. They operate the largest hospital in central Haiti and 98% of their staff comes from the local community. Paul Farmer, one of the founders, won a MacArthur genius award, and is truly an amazing person. Is it really so strange? That I don’t like strapping blades, wheels, or other moving apparatus to my feet? 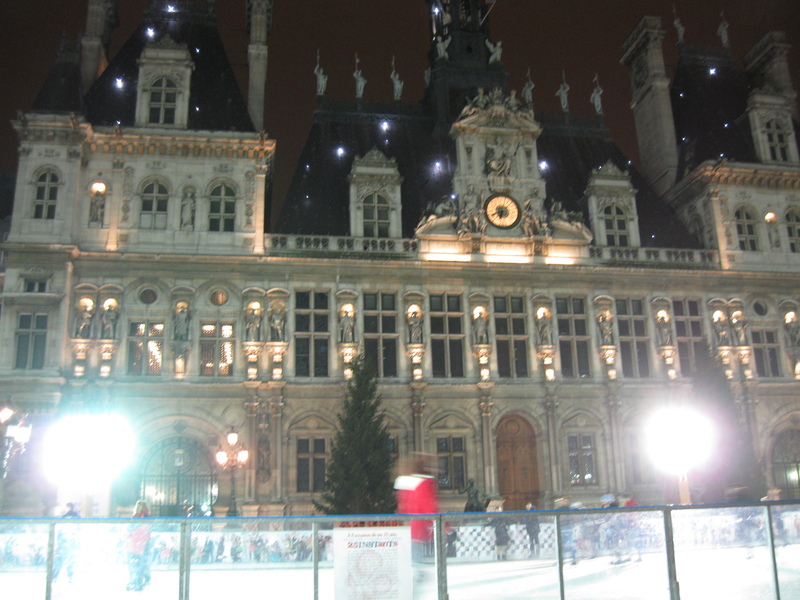 The Hotel de Ville – not a hotel, but the most beautiful administrative building you’ll ever see – still has its holiday decorations up: illuminated Christmas trees, flashing blue lights on the façade. Most striking is the large ice skating rink where funny spectacles await – put people of all ages and ability on a large slippery surface, you’re sure to have good times. I was coming back from a book signing (Wally Lamb – sweet and talented man) at Shakespeare and Co. (a tale for another time) when I happened upon the rink. I heard a voice being pumped in over a microphone, then realized there was a skating MC as I approached – slow down, speed it up, yes folks, let’s keep it fun for everyone. While I happen to like my two feet planted firmly on the ground, it gives me great joy to watch other people give skating a try. I’m a people-watcher anyway, but the interest level can skyrocket when you put them on ice. There are the small triumphs and tiny setbacks, small moments that aren’t so serious – something to hold onto in our time of very serious moments. “Si tu puedes, mon amour!” “No, no puedo” the Spanish couple gripping the railing in front of me were saying. “Start like this,” the gallant French boyfriend explains, holding his pretty (terrified) girlfriend’s hands. Couples and families, showoffs and friends. Little dramas as one person wants to go faster and the other can barely stay upright. Little kids with their daring, cheeky adolescents whizzing by at dangerous speeds. The slips, the falls, the getting back up, the trying it again. I’m not sure why these people don’t mind us watching, but I’m glad that they let us. Their vulnerability and their tricks, the glee as someone learns to glide. Thank you, random ice skating rink, for reminding me of such simple pleasures. Maybe, just maybe, I’ll join you sometime.